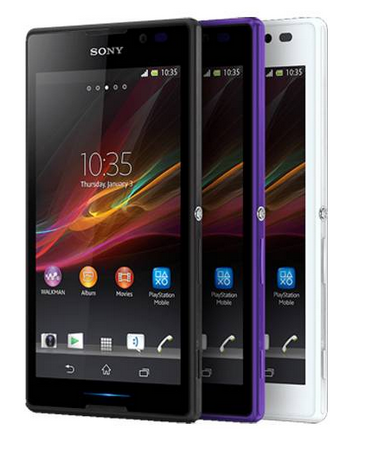 Sony officially launched, Sony Xperia C (Quick Review) its MT6589 quad core phone in India for Rs. 21,490. This phone has been available in India since last couple of weeks on various online retail websites and comes with Standard budget quad core smartphone features along with quality and after sales assurance of a big brand name. This phone comes with the low cost MT6589 quad core processor clocked at 1.2 GHz which is very common in budget quad core devices in range of Rs. 10,000 to Rs. 20,000 INR. This phone is backed by a 1 GB RAM and comes with 4 GB of internal storage which can be further extended to 32 GB using a microSD card. The Display is 5 inches in size with qHD resolution which gives you a pixel density of 220 pixels per inches which is not exactly impressive considering the price range, but will be fine clarity usable screen. On the software front this phone runs on Android 4.2 Jelly bean operating system. The primary camera sports an 8 MP EXMOR R sensor and is capable of Full HD 1080p video recording. The camera comes with features like LED flash, Auto focus, Geo-tagging, touch focus, Etc. We expect this camera to outperform those which we have seen in Budget quad core devices so far.A front VGA camera is also present for video calling. The battery capacity is 2390 mAh which will provide you with ample talk time of up to 14 hrs on 2G and music play time of up to 111 Hours. This phone supports dual SIM functionality and Connectivity features include 3G HSPA+, Wi-Fi, DLNA, Bluetooth 4.0, GPS with AGPS support. The phone will come preloaded with Walkman App for music lovers and this app will provide online and offline content through a single access point with ways to share that content. The phone also sports the OmniBalance design introduced first in Xperia Z which gives you premium look and ergonomic comfort. Though the MRP may seem a little high at Rs. 21,490 and this was also the price for which it was initially made available for, you can get this phone for somewhere between 18,000 to 19,000 INR. It will compete against phones like Gionee Elife E5 and Samsung Galaxy Grand Quattro. Hi Abhishek, How R U! Right now I am using Micromax canvas 2(A110). I want to upgrade to a quad core phone. Ur help will be much appreciated. Thank U! If U have any other suggestions please tell me. Canvas doodle 2 is good option if you want a bigger display. Canvas 4 is decent in performance, but has 720p display. Xperia C is going to be average performer – but you can expect a better after sales support as it is from Sony. Elife E6 is has the best display out of all – but it has no so good gaming performance but applications and day to day usage is satisfactory with some minimal UI lag. Let me know ur requirements if this does not answer ur question about the best phone, you can take the decision as per the points I have mentioned above. 1. Bigger display(5″ inch or more). 4. Lag free model which can play high end games well. 5. HD or FHD screen with good PPI. Thank U! Also give me tips on what to mainly check before buying a android phone. You can opt for the xolo q2000 which has been launched today, you can also opt for Lenovo K900, lenovo P780 or Huawei Ascend mate or even samsung galaxy mega. go for samsung or huawei if you want better after sales support or else if you want a better gaming device then go for canvas doodle 2 or you can also wait for Gionee Gpad G3 it will be also a great device, will get launched in few weeks. As per your usage requirements, you can select E6 it will be a great device for you. But E6 is not for too heavy games, but can handle casual games easily. Hi Abhishek2. M getting confuse between spice coolpad mi 515 and micromax canvas doodle a111 . My biggest cocern is screen display and resolution. However I also like to play games as well net also. Pl suggest. By da way m getting spice coolpad in just 6999 from home shop 18 as a special deal whereas doodle is costing arround 8500 inr. Right now m using tab 2. Pl reply at ur earliest convenient time. spice coolpad will be a better value for money in this case.